Is This a Way to Avoid Future Roland Burrises? Even if Roland Burris did nothing wrong to obtain former Illinois governor Rod Blagojevich's interim appointment to the United States Senate, Blagojevich's corruption would have Burris facing his constituents through a cloud of suspicion. Wisconsin's senator, Russ Feingold, has a proposal that might prevent future Roland Burris-style imbroglios. But, a little background is in order. The direct election of US Senators was instituted with the ratification of the Seventeenth Amendment in 1913. But the amendment, while allowing the election of people to fill the unexpired terms of senators who resigned or died, didn't mandate it. It's that loophole that allows the spectacles like the ones we've recently watched play out in places like Illinois and New York, where governors appointed senators. In the late 18th-century, there was good reason for having governors pick interim senators. Communications and transportation, necessary for the administration of elections, were cumbersome and slow. Those should no longer be obstructions to directly electing interim senators. That's why Feingold's proposal mandating such elections nationwide is probably way overdue. Of course, one look at the long-lasting 2008 campaign between incumbent Norm Coleman and challenger Al Franken in Minnesota will confirm that even the direct election of senators is no insurance against unseemly spectacle. Given the realities of human nature, reforms will always struggle to outpace the ingenious methods people devise to beat whatever system that's instituted. (Reform is always a reactive and an ongoing enterprise.) But Feingold's proposal, which seems to reflect the opinions of many people whatever their political persuasions, would have, had it been in effect last year, probably prevented Roland Burris from becoming a United States Senator. Another Entrant in 2010 Dem Race for US Senate in Ohio? Ohio: Despite both Ohio Secretary of State Jennifer Brunner and Lieutenant Governor Lee Fisher entering the 2010 Democratic Senate primary this week, Cuyahoga County Commissioner Peter Lawson Jones is reportedly moving forward with a Senate campaign exploratory committee. It will be interesting to hear how he expects to get traction against two statewide officials in the primary. My own feeling is that Governor Ted Strickland's quick endorsement of his Lieutenant Governor, Lee Fisher, for the Senate seat being vacated by Republican George Voinovich will only intensify pressure of Jennifer Brunner from her fellow Democrats to get out of the race. Jones may receive some pressure, but at this point is likely regarded as a non-factor whose presence on the ballot is meaningless...except perhaps to his future in the state party. As Ohio's secretary of state, Brunner could, if re-elected next year, play a critical role in the post-census reapportionment process. Ohio's secretary of state is, by law, part of the five-member reapportionment board. Three years ago, Democrats swept into most of the statewide offices after a nearly two-decade stranglehold on them by the Republicans. Controlling the board is a free pass to gerrymander at will--or nearly so, allowing whichever party to send more of their clan to Congress in 2012 or 2014. Brunner has already caught a lot of flack to make way for Fisher, but has so far steadfastly refused to budge. These texts fit in well with the Epiphany Season, one purpose of which is to highlight those incidents, especially the early ones, which pointed to Jesus' deity. 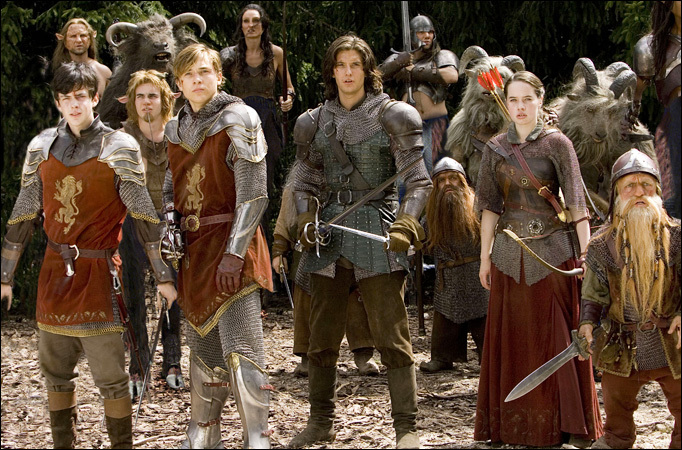 Last night, with our daughter visiting from Florida, we decided to watch a 2008 film that she hadn't yet seen: The Chronicles of Narnia: Prince Caspian. I love the Narnia novels and loved the Walden-Disney film based on the first in the series, The Chronicles of Narnia: The Lion, the Witch, and the Wardrobe. I wrote an enthusiastic review of the first film. But, on the theory that "if you can't say something nice, don't say anything at all," I wrote nothing about the second one. But in light of the fact that the Disney people, collaborators on the first two films, have dropped out of a film based on the third Narnia novel, Voyage of the Dawn Treader, and Fox has signed on, I thought that I'd mention what bothered me so about Caspian and what I think may have bothered others, especially those who are as devoted to the C.S. Lewis books as I am. The producers of Caspian seem to have made the decision that their audiences would never sit still through a plot involving so much interiority and so many character issues. They turned their Caspian into an action flick with extended--and sometimes, boring--battle scenes, far more battling than appears in the novel. (2) Too much violence and too much romance. Violence does appear in the Narnia novels, handled deftly by a writer who understood that his reading audience would largely be composed of children. Lewis never shielded his readers from the reality of violence. Nor did he dwell on it unnecessarily. The Caspian producers seemed intent on making a kind of Lord of the Rings film, filled with epic battles and fairly graphic violence. While it's a mistake to dismiss the Narnia novels as "children's literature"--they are great literature which I never encountered until I was an adult and yet came to love then as my favorite fiction of all time, their fantasy has a different feel from that in the Tolkien novels. Where the Ring stories are dense and clearly pitched to more mature readers, the Narnia books are more readily digested by younger minds and imaginations. I didn't feel that the makers of the Caspian film respected that when it came to violence. And as to romance, while it's true that in Lewis' novels, Susan would ultimately betray Narnia because of her obsession with things like fashion, boys, and popularity, there is no hint that she and Caspian were attracted to one another. Here, as in the decision to turn this into an action flick, the producers seem not to have trusted the audience to accept a story that didn't include the cliche conventions of Hollywood. (3) The film is way too long. If I lost interest in it at times, I can only imagine what families with little or no knowledge of the Narnia stories must have thought. (4) In spite of the length though, the film spends precious little time helping us to understand the characters or why they do the things they do. If I were to grade the Caspian film, I would give it a C+, as opposed to the Lion, Witch, and Wardrobe movie, which would garner a stirring A+. As Fox and Walden undertake a $140-million production of Voyage of the Dawn Treader, I hope that they'll think a little less like Hollywood and a little more like Lewis. Otherwise, a series that began with the promise of bringing to life wonderful novels which had previously only been done badly on screen, will come to grief, artistically and, I think, commercially. *If you've never read the Narnia novels, I hope that you will. I won't give away too much by speaking about Aslan here. **You needn't be a literary genius or a believer in the God of the Bible to see how this struggle mimics that faced by Moses and the ancient Israelites in the wilderness. It took them forty years to take an eleven day trip, largely because they opted for their own good sense rather than God's leading. This same motif, in different forms, can be seen in other ancient literature as well as in myths, with all of which Lewis would have been fully conversant. Rating Presidents: Not a "Parlor Game"
Historian Rick Shenkman has a point. The rating of presidents--a recent survey among historians called Abraham Lincoln our greatest president--probably doesn't even rise to the level of a parlor game. Parlor games, he says, have rules. But both historians and the public tend to rate presidents by highly movable goal posts. But I now think that, while I had good reason for picking the presidents I had on my list--my top four were Washington, Lincoln, FDR, and Eisenhower--it probably is silly to put together such ratings. The challenges facing Barack Obama, in spite of the overused rhetoric to the contrary, are not the same as those that faced Roosevelt. (The current set of presidential challenges are both less severe and more complicated than those Roosevelt dealt with, it seems.) Comparisons are tough and usually, subjective. It's probably safe to say that Grover Cleveland was a better president than Franklin Pierce, though. (In his defense, Pierce would no doubt win any presidential tippling contest.) But generally, I suppose, it's always foolish to try comparing apples and oranges--or, Washingtons and Kennedys. Or Madisons and Wilsons. At least that's what I think this week. This article could lead you to think so. But don't believe it! I don't take vitamin pills, basically because every time I've started, I've found myself incapable of maintaining the habit. So, as in other areas of my life, a bad character trait--in this case, my tendency to procrastinate in the adoption of something I've been told is good for me--has spared me. I'm willing to let the early adopters have their day in the sun. If you wait around long enough, you always look like a genius. Once, on a vacation with Ann’s family, we found ourselves in a massive two-storey sporting goods store that seemed to have a good sale on things like sweat pants, T-Shirts, and tennis shoes. But this was a sale with a twist. To take advantage of the full discounts the store was offering, customers had to sing along with karaoke accompaniment, their voices and video images beamed all over the store packed with customers for everyone to see. That was such a humiliating prospect for one of my brothers-in-law that, in spite of his being a thrifty guy who always looks for good deals, he was content with a smaller discount than he would have gotten had he sung for just two minutes. Our son Philip and I felt no such hesitation. We grabbed a couple of microphones and sang one of the all-time hokiest pop songs ever: The Carpenter’s Superstar. That’s the song that Chris Farley and David Spade sang at the tops of their lungs in Tommy Boy. “Don't you remember you told me you loved me, baby? You said you'd be coming back this way again, maybe. [Here's my favorite part] Baby, baby, baby, baby, oh baby. [People actually get paid for writing stuff like this.] I love you. I really do.” Phil and I sang and cha-ching, we got our full discounts. Now, this did happen in Las Vegas and what happens in Vegas stays in Vegas, unless you’re a preacher looking for a good sermon illustration. But how many of you think that you’d sing for a packed store in order to get a discount on some clothes or shoes? And how many of you are too Lutheran to do that? The truth is that most of us will do almost anything to avoid public embarrassment…even me. What’s behind that? And yet, as I read the Bible, one of the things God seems to keep insisting on is our need to get small. But small compared with God. Small enough to call God Lord and to take directions from God alone. Small enough to admit that we need God for life in this world and life in the world to come. We see that theme again in our first lesson for today, taken from Second Kings. It centers on something that happened in the life of a proud man who was widely hailed as a person of power and importance in his country. Naaman was a commander from the country of Aram, a place you and I know today as Syria. This incident took place sometime during the late ninth century BC. It happened about one-hundred years after God’s people, the nation of Israel, had split into two different kingdoms because of their hunger for power and because they couldn’t get along any more: Judah, with its religious and civic life centered on Jerusalem, in the south, and Israel, whose religious and civic life centered in Samaria, to the north. Naaman’s country, Aram, was a powerful and frightening neighbor for Israel. As our lesson notes, Naaman often took his armies into Israel and kidnapped people to be slaves. For this and, apparently, other exploits, Naaman was a BMOC—Big Man on Campus—in Aram. Our lesson underscores how big Naaman was in several places. He was, we’re told, “commander of the army,” “a great man and in high favor with his master [the king],” and “a mighty warrior.” You didn’t mess with Naaman. But Naaman had a problem. He suffered from leprosy. In Biblical times, the word leprosy was used to describe a whole host of different diseases that caused skin lesions or loss of feeling, especially in the extremities, hands and feet. For people who lived in those times, leprosy was a more than a physical ailment. It was also a spiritual and social affliction. In popular culture, people regarded leprosy as a curse from whatever deities in which they believed. Even in Israel and Judah, among God’s people, once a person was certified as suffering from leprosy, he or she was considered dirty and unfit for fellowship with God or people. For fear that others would somehow contract their disease, lepers had to leave home, family, and work behind. They were barred from worshiping. People often threw stones at them to keep them at bay. So that others could see and avoid them, lepers were required to wear torn clothing, leave their hair disheveled, and shout out, “Unclean! Unclean!” when they walked down the street. The leper lived a lonely and isolated life. Either Naaman’s leprosy had not gotten so horrible or his status as a hero in Aram was so great that he was not yet forced to live in isolation. But it must have been humiliating for someone so powerful to deal with the whispers of condemnation behind his back, the averted eyes of those who stood in judgment of him, and the prospect of being sent away with no army to command and no one to look up to him. Our lesson says that a little girl, a slave from Israel working in Naaman’s household, took pity on her master. She suggested that he go to Israel and see God’s prophet, Elisha, who had taken over the ministry of the more famous Elijah in about 848BC. Elisha, she said, could cure Naaman of his leprosy. Naaman was just desperate enough to ask his king for permission to go to Samaria—Israel—to seek a cure. Going to Israel in itself must have seemed humiliating to Naaman. But as we read on, we see that he hadn’t gotten small enough in his own eyes. Both he and his king assume that it will be the king of Israel who will free him from his leprosy. He takes gifts—including silver, gold, and clothing—along with a letter from his king asking for a cure. The king of Israel is sure that it’s a pretext for picking a fight. He knows that he can’t cure leprosy and if he can’t, he’s sure that Aram will attack his country. But then Elisha the prophet gets wind of Naaman’s visit. Elisha sends word by way of a servant that Naaman should come to his place. Naaman expected to be given the royal treatment by Elisha. But instead, cooling his heels outside of Elisha’s house, Naaman is given Elisha’s instructions through a servant. “Go, wash yourself seven times in the muddy Jordan River.” This is the last straw for Naaman, utter humiliation. How small should he be expected to become? The Jordan, he complains, is a creek—or a crick—compared to the great rivers back in Aram! Finally though, Naaman is convinced to follow Elisha’s directives and he is healed, this great man suddenly having the “flesh of a young boy.” Naaman learned something that Jesus would tell His disciples some nine-hundred years later, “Unless you have the faith of a child—until you get smaller than God and trust in Me—you will never enter the kingdom of heaven.” Naaman humbled himself to receive the healing God offered through His prophet. More importantly, this foreigner came to believe in God, entering the Kingdom of God. You and I need to be small enough to embrace the great promises of Jesus to be with us today and to give all who repent for sin and trust in Him eternity. We also need to subordinate ourselves to Christ to lead the kinds of useful lives God has in mind for each of us. This is a lesson God has had to teach me repeatedly. Naaman learned that all the honors of the world mean little. But he also learned, as many of you have in a lifetime of following the God we know in Jesus Christ, the truth of James’ words in the New Testament: “Humble yourselves in the sight of the Lord, and he shall lift you up" (James 4:10).